So here we are. Five divers and I, hanging at a depth of 18m, about 80m from the reef edge over an unfathomably deep drop off, looking at each other. Did that just happen? Did we just have a rather intimate close encounter with the largest fish in the world? Apparently so. 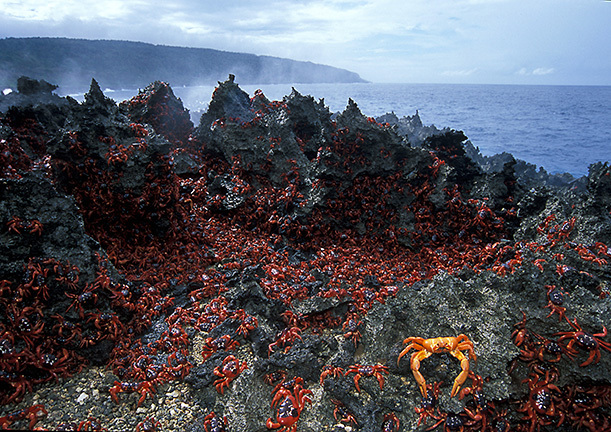 Red crabs at Blow Holes, Christmas Island, Australia. Photo by Chris Surman. We were alerted to this gentle giant’s approach by our dive guide Hama, who, hanging out in the blue, spotted the gentle giant approaching and alerted us with a crazy rattling of his tank-banger. Scott Portelli, the keenest photographer among us (and fastest swimmer), had swum out into the blue twice as fast as the rest of us to get that one great shot before she turned away. But she did not turn away. She kept on coming, swam up to and around Scott, passing right in front of us, pausing only for a moment to look Scott in the eye and smile. Well it looked like a smile—she opened her mouth slightly, turned gracefully and 10 seconds later had dissolved into the deep blue from whence she came, leaving us gaping incredulously at each other. We are going to remember this day for the rest of our lives. 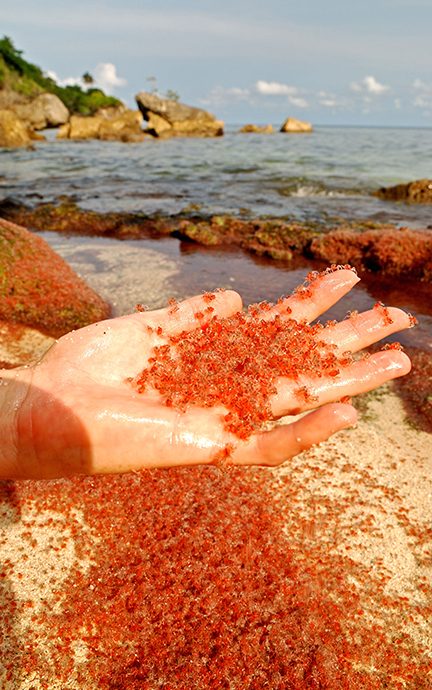 In fact, today has been a long day full of wonders that started at 3:00 a.m. as we witnessed the spawning of several million red crabs on the shoreline of Christmas Island. We had all been so desperately hoping to see a whale shark, had I not captured it on camera, I could well have just made the whole experience up in my head. It was that surreal. The whale shark is the largest living fish on the planet and completely harmless (unless you are a plankton or red crab larvae—then you are lunch) and to be engaged by such a creature leaves an impression that will never wash off. 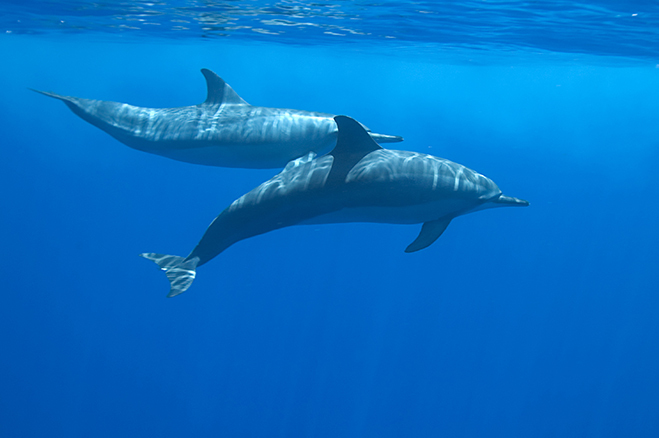 As an ocean-going filter feeder, we know very little about their movements and behaviour. 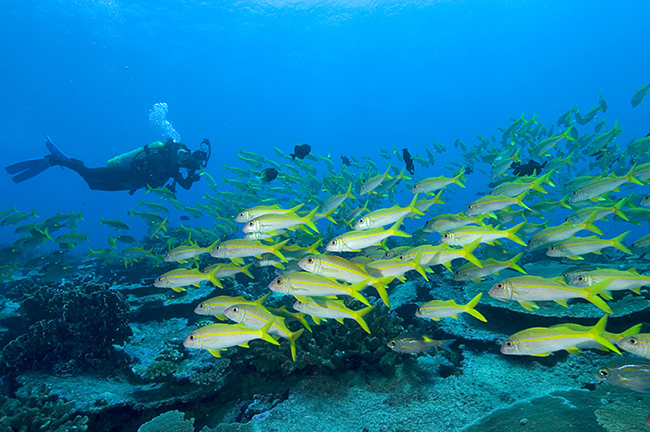 There are a few places where encounters with divers and snorkelers are almost guaranteed. 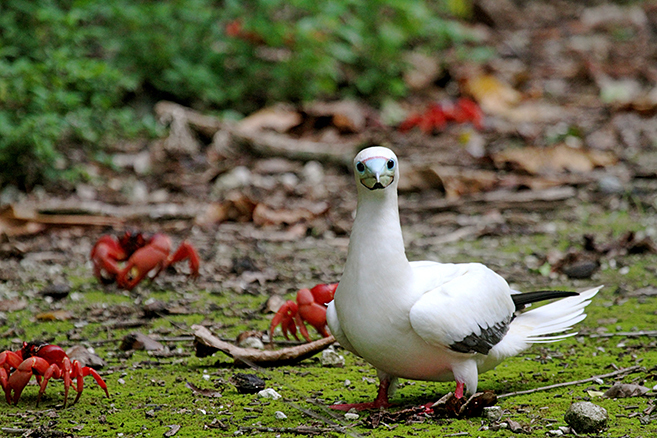 At Christmas Island encounters are not exactly common, but when they do occur, they are completely natural, and very special. The whale sharks are often sighted around the time of the annual red crab migration, when the red crabs release their eggs into the ocean to spawn, which in itself is one of the most amazing wonders of the natural world and why we had been up since 3:00 a.m. to observe it. 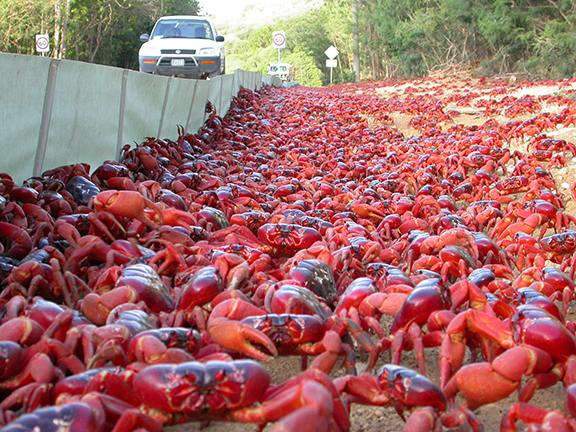 The red crab (population 60 million), is Christmas Island’s (population 1,200) endemic land crab. Every wet season, if the conditions are right, they all come down to the beach to fulfil an annual reproduction ceremony. The males head off first and dig a cosy little burrow near the shoreline. The females arrive a few days later, having made the 5km trek at an average speed of 1km per day. The whole exercise is dependent on there being enough rain to keep the crabs moist on their epic journey, and, on the phase of the moon. The crabs only release their eggs just after the turn of the high tide when the moon is in its final quarter and the waves are at their lowest. This gives them the best chance of standing in the shallows on the shoreline without being washed away by waves and shimmying their precious payload of eggs into the out-going waters where they will be carried by the out-going tide to spawn in the waters off Christmas Island. 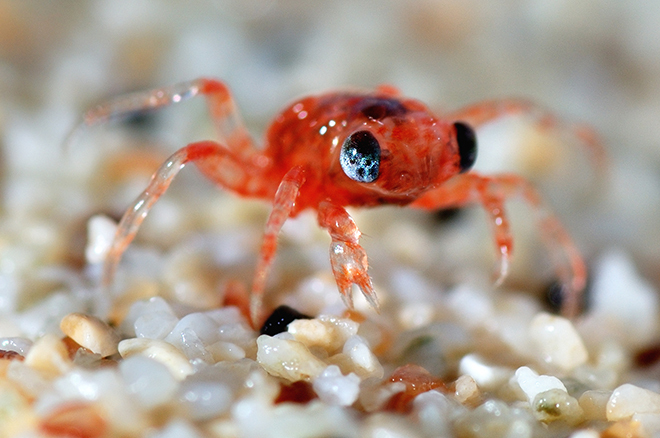 Turning from eggs to larvae to tiny red crabs (about the size of your pinkie fingernail), they return six weeks later to make the 5km journey back into the wet interior on their own. So, after getting up before dawn to witness the amazing spectacle of several thousand red crabs shimmying their eggs into the sea, a spectacle duplicated at all the beaches and coves around Christmas Island, we grabbed some breakfast and headed out for a day’s diving on Hama’s dive boat which is called Feral. 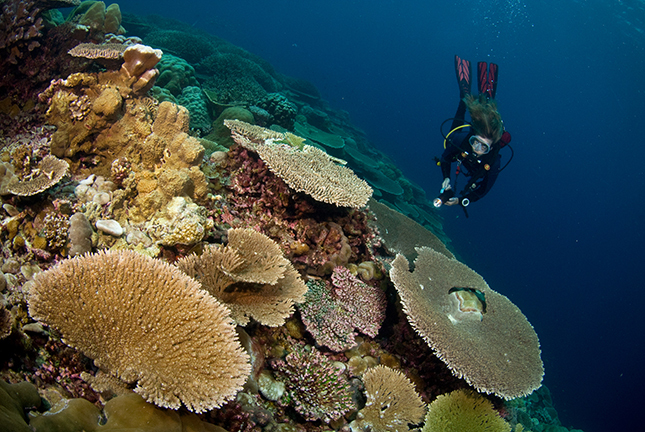 The unique location and geology of Christmas Island delivers corals that are twice the size and extent that you would expect. Because there is so little fishing in these waters, the marine life is as abundant as it is diverse—you will be hard pushed to see such numbers and variety in any other one place. 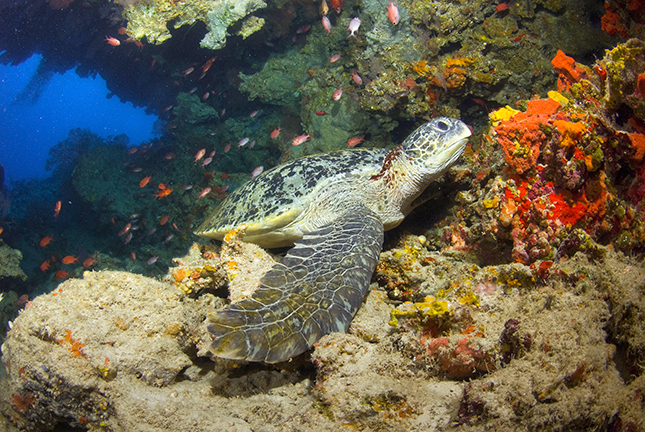 The marine inhabitants of any diving destination are defined by its terrain and location. 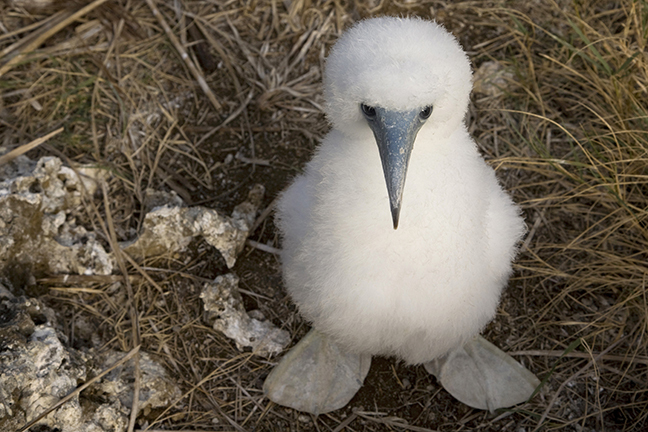 Christmas Island scores high on both counts: being the top of an extinct, steep-sided volcano that rises 6,000m from the sea floor below, and located 300km south of Java in the Indian Ocean. 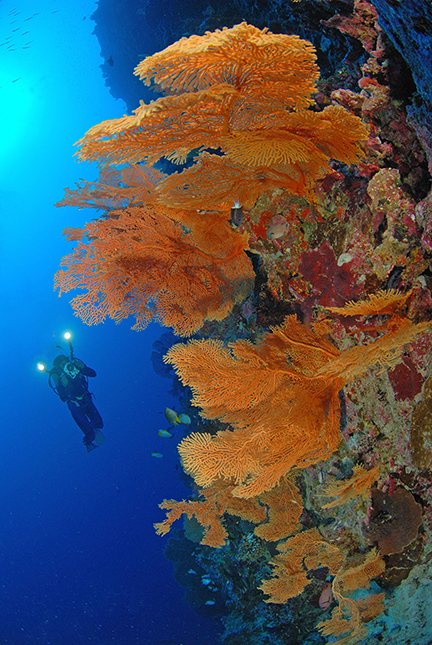 Ten degrees south of the Equator, with abundant sunshine and nutrient-rich up-wellings, the steep-sided walls are covered in pristine coral reefs down to 20 or 30m where great gorgonian sea fans take over. Conditions like this are perfect for all kinds of fish—from the smallest to the largest, and Christmas Island boasts about 650 identified species all up. 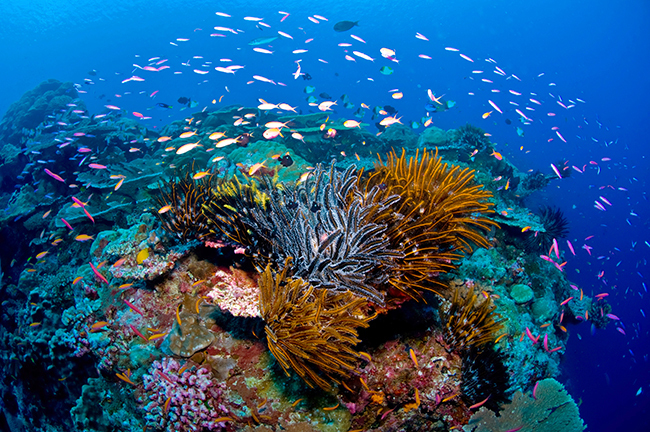 The coral reefs are home to great shoals of herbivores and parrotfish. 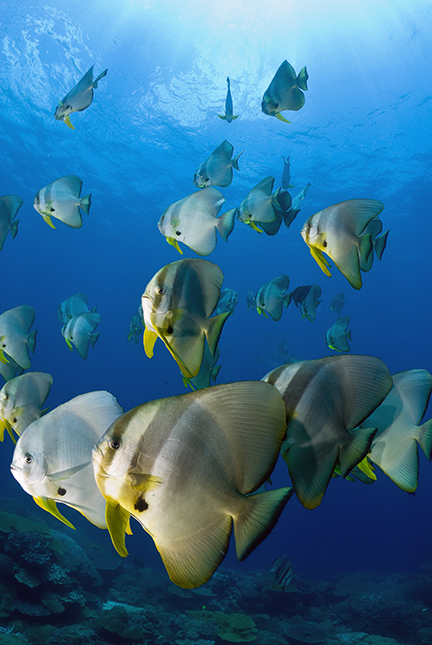 Surgeonfish and unicornfish can be seen working their way along the corals on every dive. On the near-vertical walls, the fusiliers stream up and down in search of plankton, and in the pocillopora coral heads, humbugs and hawkfish play hide-and-seek with divers as they pass. There are dive sites all the way around the island and not all are steep walls. Some of the bays have shallow reefs sloping down to the drop-off. In the sheltered areas, feather stars congregate creating a small and colourful meadow, and it is here that turtles are often found resting. Giant morays hiding amongst the corals and rocks keep watch, as wrasse, rabbitfish and titan triggers cruise by. The island also has its share of caverns and caves, and some of these weave through the volcanic rock coming out into the ocean below the waterline. 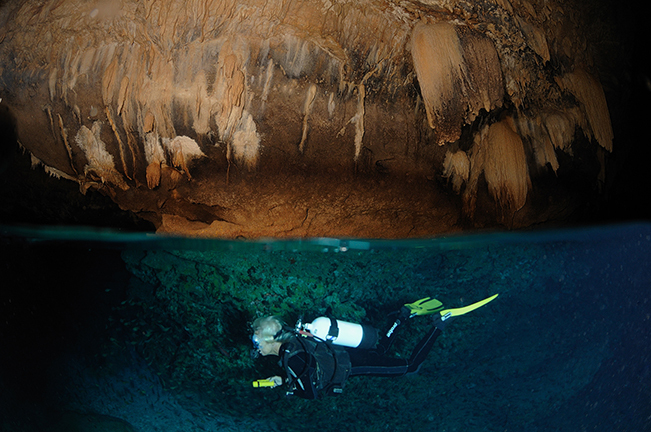 They are easily explored by divers who can surface inside the caverns to see great stalactites hanging above them. There is no urban pollution from the island and being 300km from any neighbour means that the waters are exceptionally clear. It is often possible to see the reef sharks and eagle rays patrolling the reef wall 20m below. Being steep-sided allows deep-water pelagics to come in close to the island’s shoreline, so you can expect to be treated to some exceptional, though often brief, encounters with ocean going manta rays, scalloped hammerhead sharks and other delights on your average dive day—perhaps a school of silky sharks cruising around 10m below you or a pod of spinner dolphins playing around you. And maybe, just maybe, if the rains are right and the moon is waning, and all your Christmas’s come at once, you will have an encounter with the largest, gentlest giant you could hope to meet—an encounter that will make you an ocean advocate for life. Where your dive guide takes you will always depend on conditions on the day, but be assured, it’s all good! 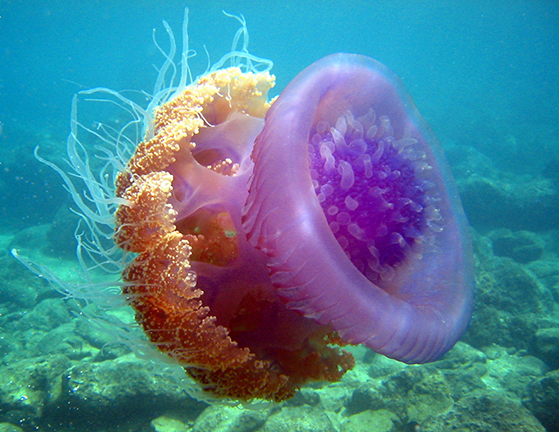 Spend a few days on the island, however, and you are bound to visit these signature dive sites. Perpendicular Wall. As the name implies, Perpendicular Wall is completely perpendicular to the ocean’s surface. It falls away almost vertically a few metres from the surface, the corals leaning out as far as they can to catch the sunlight. Large gorgonians extend perpendicular to the wall to catch as much as they can from the passing currents. It is a riot of colour and teeming with fusiliers that seem to take great pleasure in schooling up and down the vertical wall, whilst the other reef fish travel horizontally along it. The dive starts under an overhang with fantastic sea fans and falls away pretty much vertically as you head left towards the northwest tip of the island. 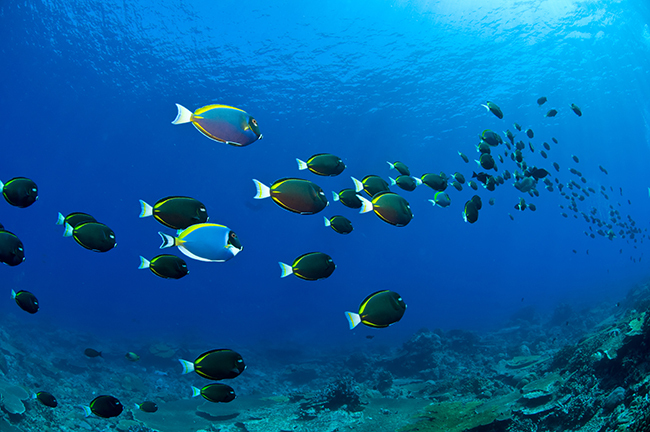 The wall is literally teeming with life: great corals and shoals of fish, both small and big. Along the wall, sea fans, feather stars and hydrocorals add even more colour, and at the end of the dive, there is a lovely 5m reef to explore while you do your safety stop. Flying Fish Cove. This shore dive rates as one of the best shore dives in the world, and one you can easily do on your own, having rented a tank from one of the local dive operators. It’s more or less in the centre of town. Step into the turquoise water from the beach of the boat ramp, and within a few metres, you will be surrounded by pristine coral gardens. Follow the line of the ramp straight out until you hit the drop-off. Turn towards your left and work your way down the drop-off to about 18m, just following along the slope. After about 20 minutes, come back up the 9m on the slope, turn a sharp left towards the shore line, and then work your way back along the shallows at 9m, navigating back up the ramp via the two chains, which are laid out like airport landing lights to guide you back in. It is a very easy dive. You really can’t go wrong, and you will see more fish and coral types in that one dive than you would see in a week at other places, including several species of butterflyfish, hawkfish, squirrelfish, rock cod, blue tangs and the odd turtle. 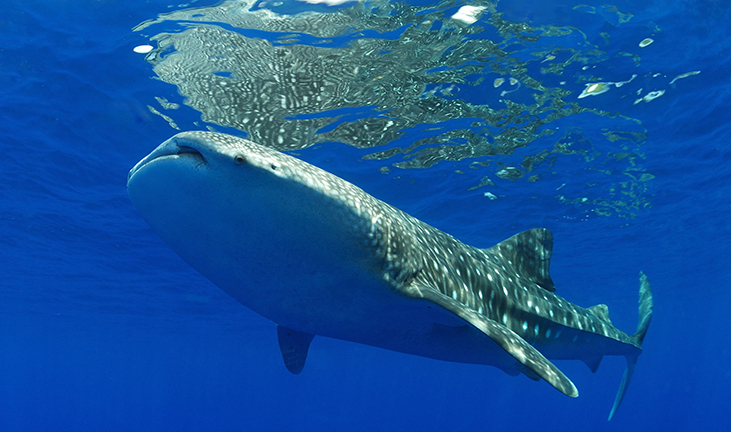 In season, it is also fairly common to encounter whale sharks at the drop-off. After the dive, there are toilets and showers in the carpark where you can wash down your gear, and gas barbeques to knock up some lunch. Thundercliff Cave. There is, in fact, more than just one cave; it is a system of caves that you can actually follow deep inside the island. But most divers visit the first two: a big open chamber with very nice blue light at the entrance, and a second cave beyond and accessible via the first. The second cave has the more interesting stalactites and stalagmites—particularly one tall, thin column, which looks almost too thin as it is almost cylindrical rather than the typical conical shape of a stalagmite. There is also a formation referred to as a hanging shroud. Outside the cave, there is a flatter reef at about 12m, which has lots of the usual reef suspects: leatherjackets, several species of butterflyfish, surgeonfish and a host of goldspot seabream. There are plenty of wildlife encounters to be found on dry land between dives on Christmas Island. As the island is quite small, whichever you choose to explore—whether that’s hiking, bird-watching or scuba diving—all activities can be undertaken as a day trip from the main settlement, funnily enough called Settlement. The Dales. 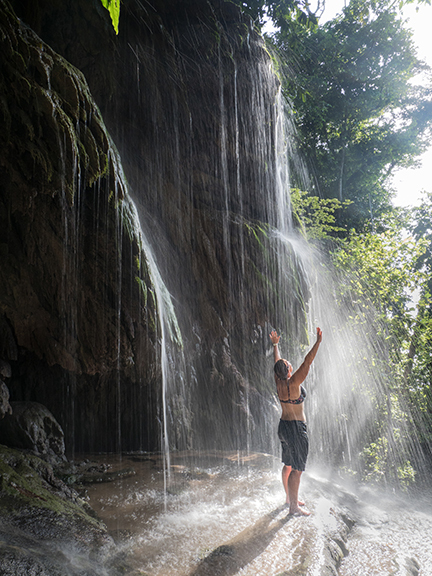 Take one day to trek through the Dales along marked trails that wind through tropical rainforest and waterfalls, looking down amongst the winding roots of the giant figs for the island’s endemic land crabs. 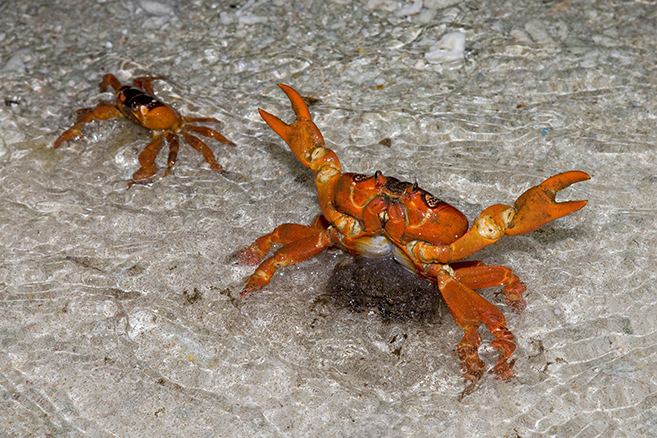 There are literally tens of millions of them throughout the forest, from the abundant red crab to the massive robber (sometimes called coconut) crabs. Daniel Roux Cave. On another day, visit the Daniel Roux Cave; there are no lights, no handrails, no steps and no admission fees, so be sure to take a couple of touches to see the magnificent stalactites and stalagmites that rival the majesty of any cathedral. 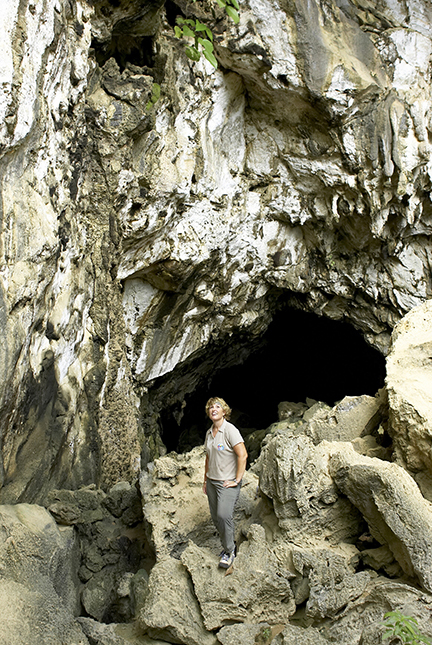 The cave is home to a large colony of small bats, which tend to go where they hang—it can get slippery underfoot, so be careful where you put your feet, and do not wear your Sunday Best. The Grotto and Blow Holes. There are other little features of natural wonder scattered throughout the island: remote beaches where turtles nest, a little sunny grotto of saltwater (called The Grotto) and the Blow Holes on the south coast where the Indian Ocean is forced up through volcanic shafts expelled in plumes of spray. Bird watching. Looking up, large frigate birds can be seen riding the ocean breeze, scanning the waters below for dinner, and tropic birds loop the loop, dancing in the warm air currents. Looking down, you might find some brown boobies nesting on the ground, their eggs laid literally on what amounts to a huddle of sticks and stones. These birds have no fear of humans, so there is no need for an enormous camera lens; you can get a close-up with your iPhone. On the way back, a visit to the golf course offers great vistas over the ocean and the chance to see another rare specimen: the red-footed booby—a great colony of which will live in a single tree. Multicultural Cuisine. And all this can be found in a place where, at the end of a great day’s exploring, a multicultural community offers the prospect of a great Malaysian-style curry, an authentic Chinese dish, or a good old-fashioned fish ‘n’ chips with a cold beer or a chilled chardonnay at the Golden Bosun Tavern—the best place on the island to catch the Indian Ocean stunning sunsets. There are two dive centres on Christmas Island: Extra Divers, who can cater large groups of up to 16 divers; and Wet‘n’Dry Adventures, who offer an intimate experience. Wet’n’Dry Adventures, a PADI dive centre, is a small and friendly family business that has been operating on Christmas Island since 1994. The operator is Hama, his second-in-command is Linney, and his boat, which takes up to five divers, is called Feral. Hama’s philosophy is to fit two dives into a half day so that you are free to use the other half day to see more of Christmas Island. Linney bakes something fresh every morning: apple turnovers, date and walnut cake, or muffins. So, between dives, there is fresh bakery and hot drinks to look forward to (divingchristmas.com). You can fly to Christmas Island from Perth (twice weekly) or Jakarta (weekly). Occasional charter services are also available from Kuala Lumpur. 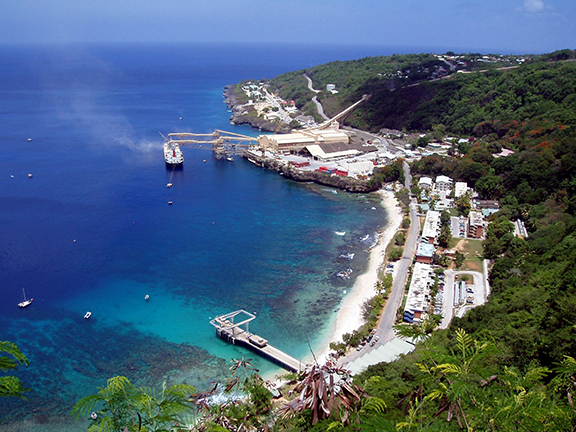 For more information, visit Christmas Island Tourism Association’s website at: Christmas.net.au.